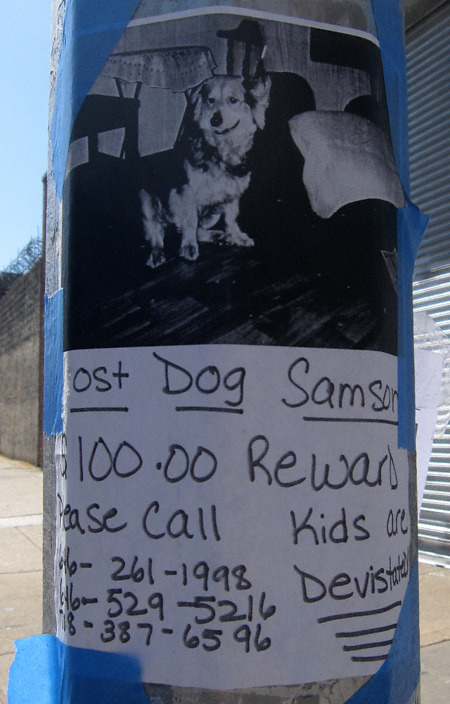 Last Gasp: Has Anyone Seen Samson? I knew I was forgetting something when I wrapped up today’s posts. Naturally, I remembered immediately after I hit the “publish button”. If anyone has seen Samson or knows of his whereabouts please contact his family at the above telephone numbers. NOTE: the prefixes for the previous (which I absent-mindedly cropped) are as follows: 646, 646 and 718. One Comment on Last Gasp: Has Anyone Seen Samson? These always break my heart. Get home, Samson!! !